Great device with many functions. The energy bank allows power, charging of various devices, and can also help start up internal combustion engines. With a portable charger, you can charge, for example, a phone. For this power bank, charging a tablet or other device is not a problem. This great charger can also power laptops - 19V, 16V or 12 V. However, the most interesting feature of this mobile charger is the fact that charging also AC devices (ie AC powered). This power bank can power any device up to 500 W power, for example grinder, Mixer , Juicer, etc. Powerbank also has two lamps. How to deal with the DOCA D-G600 Black Portable Charger? The energy bank is an intuitive device. Has a display that shows the amount of available energy. Please note, however, that the powered device can not have more than 500W. What skills does this powerbank have? LED flashlights and LED lamps can power up to 70 hours. Can be used to cook 2 hours. Watch TV for 5 hours. 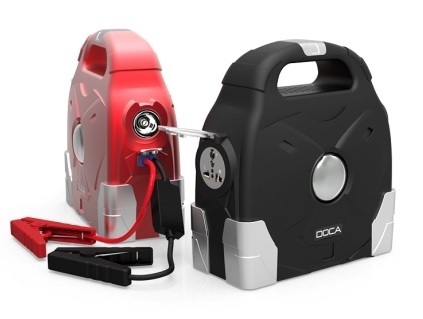 The DOCA is a great device that supplies all home appliances and tools (power supplies only 500 watts). Such an energy bank is essential for far-sighted trips where there is no access to an electrical outlet. Such a power bank is a must for technical assistance, as it is a great help in starting up a vehicle. Such a mobile charger is also necessary for a builder, so this device no longer has no problem when there is no electrical outlet. This charger has thousands of uses. Black power bank is custom made, delivery time is about 10 days. Did you know that DC stands for DC?